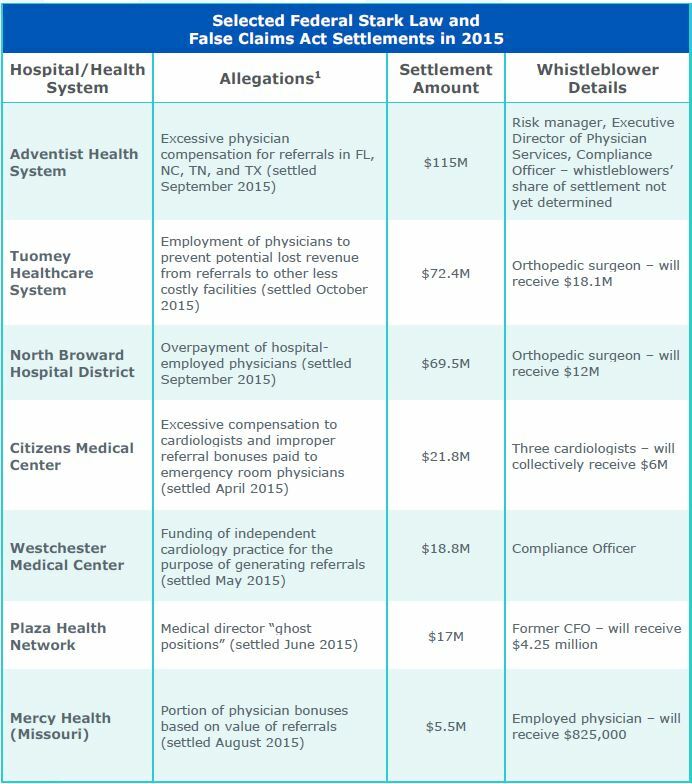 A parade of headlines announcing record-breaking settlements (chart below) has left healthcare executives, lawyers, consultants, and even physicians wondering if they could be exposed to regulatory or legal action as a result of any of their employment or other physician-hospital alignment arrangements. The government’s incredible return on investment on enforcement actions, as well as a provision in last month’s budget deal that could potentially lead to even greater penalties, and the prospect of large payouts to whistleblowers combine to ensure that allegations will continue to be made. Further complicating things, the government has begun to cast its net wider. Ensuring that physician compensation is consistent with fair market value has long been a top priority for healthcare providers, as it should be given that it has been the primary focus of regulators. Recently, though, the government has increased its focus on the “commercial reasonableness” of physician-hospital arrangements. The commercial reasonableness test boils down to this: “Does this arrangement make business sense in the absence of any potential referrals?” Even where payment levels are consistent with fair market value, it is essential to also be able to say yes to the commercial reasonableness test. Physicians are beginning to understand the implications of excessive compensation and the fact that they too are at risk. An OIG Fraud Alert published in June warned physicians of the significant liability that may result from excessive compensation arrangements, highlighting a recent settlement with twelve physicians who entered into questionable medical directorship and office staff arrangements. The physicians, an integral part of the arrangement, were subject to liability under the Civil Monetary Penalties Law. Educating physicians about these concerns may help health systems in compensation negotiations. The more physicians understand the risks, the more they should be willing to dial down the deal heat and agree to reasonable compensation terms. Despite the new challenges, it is still possible to structure arrangements with physicians where compensation meets both fair market value and commercial reasonableness tests, by appropriately engaging the support of legal and valuation professionals with strong expertise and experience in these specific areas. Those experts can identify areas for further review, help structure arrangements to mitigate regulatory exposure, and advise you when to reconsider or walk away from a troublesome deal. Learn more about how Veralon can help make sure your physician compensation arrangements comply with laws and regulations. 1 Details of each case are available through the Department of Justice website (http://www.justice.gov/justice-news?topic=3936) and many other sources available on the internet.